Advaita-Saadhanaa – Kanchi Maha-Swamigal’s Discourses. Kanchi Maha-Swamigal also known as Periyavaa repeatedly preached about the importance of following the Dharmic path and Advaita – non-duality. His various discourses are available in a pack of six volumes called ‘Deivathin Kural’ (Voice of the Divine) which have been compiled by R. Ganapathi, a devotee of Periyava. These books are available only in Tamil, however a condensed form of these books is available in English. 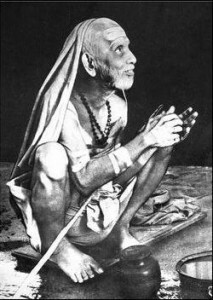 Kanchi Maha-Swamigal also known as Periyavaa repeatedly preached about the importance of following the Dharmic path and Advaita – non-duality.